Editor’s NOTE: This post is from August 2011 and thus is outdated, as the Official Community site’s guild forums closed down in mid January. Stay tuned for an updated set of resources! Even though Star Wars: The Old Republic (SWTOR) lacks a publicly known release date, folks are already starting to feel like they want to get the age-old top MMO to-do item out-of-the-way: finding the guild they’ll start the game with. 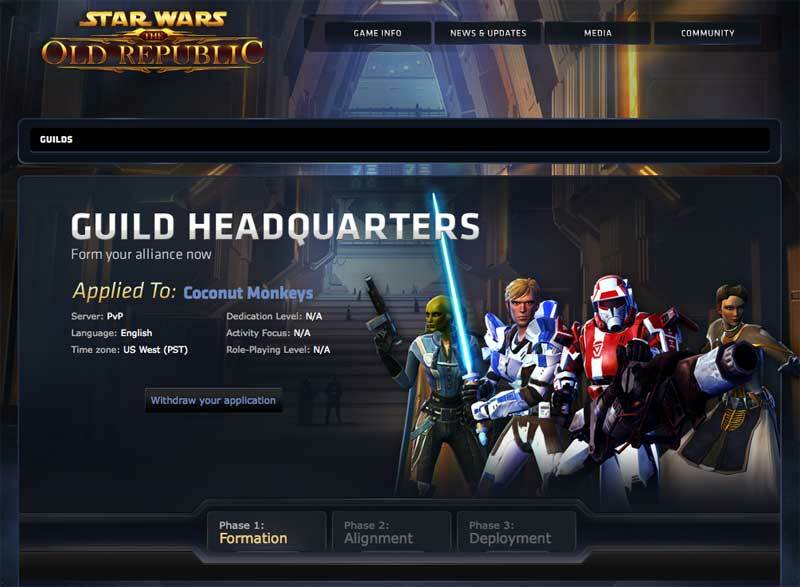 If you’re not lucky enough to have a solid group of MMO-playing friends who are planning to start a SWTOR guild, there are still a number of ways to find a guild. As of this morning, the official community site’s guild search utility found over 30,000 results when searching for an Empire guild, and over 24,000 Republic guilds. The tool allows you to search by affiliation (Republic or Empire), or by primary activity focus (PvP, PvE, RP.) Many guilds already have some public forum chit chat going, which gives you a taste for what their culture may be like. Other have already started recruitment threads in the Guild Hall forum to give prospective applicants a better idea of what they’re looking for. Once you find a guild that look appealing, just hit the “Apply to this guild” button, and you’re set. Now your guild homepage will show that you’ve applied to the guild. Should you have clickers remorse you can easily hit the “withdraw your application” button, and start over again. Kudos for EA/bioware for allowing the guild formation process to start ahead of the live date. Probably the best way to find a guild of like-minded people is simply to put it out there in your social media channels of choice that you are excited about playing SWTOR and see who responds. Another easy way to get a pulse on interesting people you might want to be guilded with is to follow the #SWTOR tag on twitter, tumblr, or other social networks. In addition to a steady stream of news and blog post links, you are likely to see a number of guild promos as well. If you have other ideas or resources for finding SWTOR guilds, let me know in the comments. Many people probably aren’t aware there is a guild application in your account settings. A little different way of doing things then we are used to, but makes sense when you think about it. You fill it out once and if you use their system you are good to go with whatever guild(s) you apply to in the future. Thanks hon — I didn’t poke around in my account settings and totally overlooked that. Will correct my post when back at keys.